KAUKAUNA – The Live! from Hydro Park summer concert series kicks off the 2017 season Wednesday, June 7 2017 with a performance from fan favorite Kyle Megna and the Monsoons. 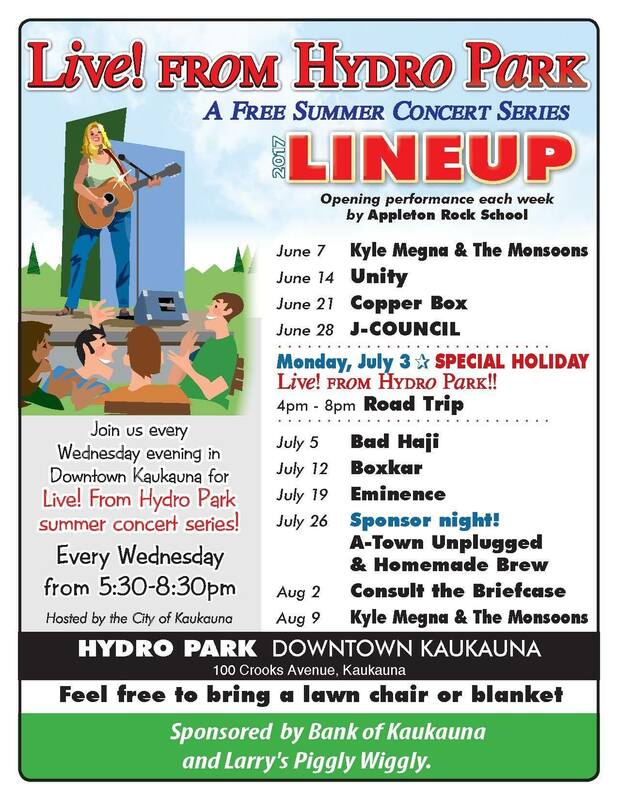 The shows take place from 5:30 p.m. to 8:30 p.m. Wednesday evenings in Hydro Park at the river downtown. The series kicks off June 7, 2017 with a performance by Kyle Megna and the Monsoons. Megna, a Kaukauna native, plays music that is fused with a healthy dose of spontaneity and humor. The shows are hosted by the city of Kaukauna and sponsored by the Bank of Kaukauna, Larry’s Piggly Wiggly, Abel Insurance, Carsten’s Ace Hardware, Van de Hey Financial Services, Precision Paper Converters, Precision Scrapping and Alignment, Heid Music and the Lox Club. For more information, or to sponsor, contact Gidget Peerenboom at 920-766-6304. June 14, 2017: Unity the Band: They treat fans to old roots Reggae faves, along with original music blending influences of roots, rock, blues, funk and reggae into their own unique sound. June 21, 2017: Copper box: Roots/Americana quartet loaded with energy and a mountain of instruments, influenced by blues, jazz, rock and polka. June 28, 2017: J-COUNCIL, features music written by Jon Wheelock and Sam Farrell and produced by Grammy nominated Cory Chisel. Special Monday, July 3, 2017 holiday show, 4 p.m. to 8 p.m., Road trip, a rock band based out of Oshkosh, they cover music including Janis Joplin, Tool, Finger 11, Kelly Clarkson and many more. July 5, 2017: Bad Haji performs locally and will have a show June 11 at the Electic City Experience. July 12, 2017: Boxkar: Based out of Appleton, the band has traveled around the country promoting their own brand of rock ‘n’ roll and their love of songwriting and performing. July 19, 2017: Eminence, a rock band formed in March of 2013 from musicians all around the Fox Valley. Aug. 2, 2017: Consult the Briefcase: Pushing out rock and blues anthems, reincarnating the soulful wails and thunderous groove-soaked riffage of an era gone but not forgotten.